cci.org | 365 Days of Puppies! Santa Rosa, California—The 2019 Canine Companions® Puppy Calendar is chock full of squishy puppy faces and lots of over-the-top cuteness. The puppies featured in the calendar have a very important purpose—they are on their way to becoming life-changing assistance dogs for a child, veteran or adult with a disability. Born and raised in the homes of loving volunteers, Canine Companions assistance dogs are professionally trained in over 40 commands that enhance independence. For a limited time, your donation to support Canine Companions will get you 365 days of puppies and $60 in coupons for Eukanuba dry dog food. With a $25 donation, you will receive the 2019 puppy calendar as our gift to you! The 2019 Canine Companions puppy calendar is chock full of squishy puppy faces and lots of over-the-top cuteness. The puppies featured in the calendar have a very important purpose—they are on their way to becoming life-changing assistance dogs for a child, veteran or adult with a disability. Born and raised in the homes of loving volunteers, Canine Companions assistance dogs are professionally trained in over 40 commands that enhance independence. You can never have too many puppy pictures, so we have another present to make your friends and family squeal from the cuteness: Canine Companions puppy holiday cards are available with a donation of $15 or more. 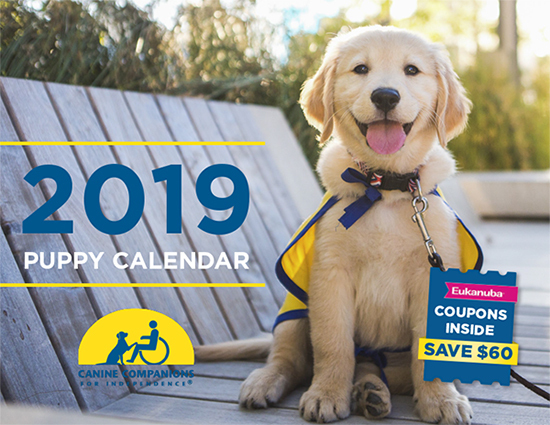 Spread some puppy love this holiday season and support the life-changing mission of Canine Companions; to provide expertly-trained assistance dogs and a lifetime of support for children, veterans and adults with disabilities, entirely free of charge. Since 1975, Canine Companions has placed over 6,000 assistance dogs trained to retrieve dropped items, pull a wheelchair or alert to important sounds in the environment and so much more. Get your free calendar and holiday cards today by making a donation. This holiday season, you can give a dog a job. Make your gift to get a gift and visit cci.org/calendar.